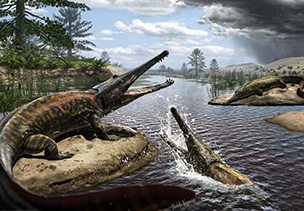 Published yesterday, in Palaeobiodiversity and Palaeoenvironments (see here), paper co-authored by Giovanne Cidade, with colleagues from Instituto Venezolano de Investigaciones Científicas, describing new fossil crocs from the Castillo Formation, Miocene of Venezuela. 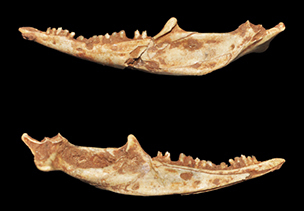 On the left: a Purusaurus lower jaw. 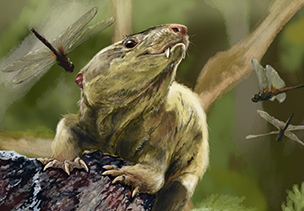 Published today in Royal Society Open Science (see here), paper by Mariela Castro, Julio Marsola and Max Langer, with colleagues from Unicamp, MIT and Museo de La Plata, describing the first mesozoic mammal from Brazil, Brasilestes stardusti. 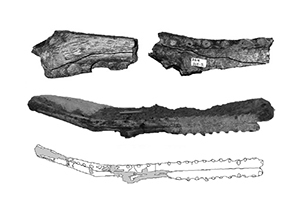 Published today in Zoological Journal of the Linnean Society (see here), paper co-hautored by Max Langer, with colleagues from UFSM and UFRGS, describing a new dinosaur species from the Triassic of Rio Grande do Sul, Bagualosaurus agudoensis. 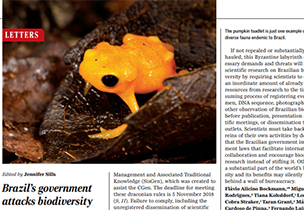 Published today, as a Letter in Science (see here), note from various Brazilian researchers, including Annie Hsiou, warning abou the problems of the new rules from the Conselho de Gestão do Patrimonio Genético (CGen). 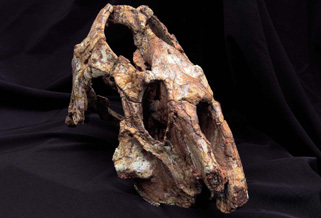 Published today, in Zoological Journal of the Linnean Society (see here), paper co-authored by Max Langer and Mario Bronzati, with colleagues from CAPPA/UFSM, describing a new and well preserved specimen (skull in the photograph) of the triassic dinosaur Buriolestes schultzi. Las week, May 10th 2018, Julian got his MSc degree from the Comparative Biology graduation program, FFCLRP-USP. In the photo (left to right): Felipe Montefeltro, Mario Bronzati e Rodrigo Santucci (board), Julian and Max (supervisor). Congrats Julian! 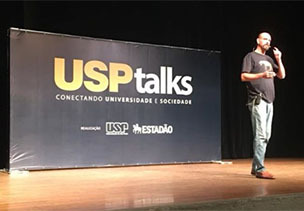 This Tuesday, April 24th, talking about Brazilian dinosaurs, Max took part in the 18th edition of the USP talks event, at Museu de Arte de São Paulo (MASP) and promoted by Universidade de São Paulo and the newspaper O Estado de São Paulo. The complete footage can be seen here. 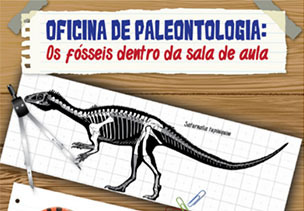 Published today, in Revista de Cultura e Extensão da USP (see here), outreach paper by Pedro Godoy, Gabriel Ferreira, Elisabate Dassie and Annie Hsiou, with collague from UNESP, talking about the activities of the project "Oficina de Paleontologia: os fósseis dentro da sala de aula". 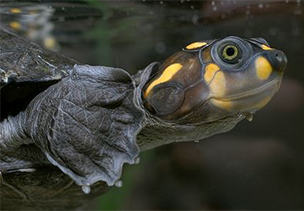 Published today, in Royal Society Open Science (see here), paper by Gabriel Ferreira, Max Langer and Mario Bronzati, with colleague from do Museo Paleontológico Egidio Feruglio, revising the phylogeny, biogeography, and diversity patterns of pleurodire turtles, such as Podocnemis unifilis, in the photo. 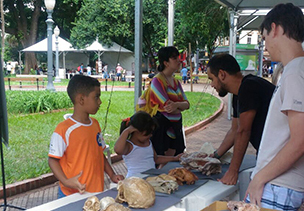 Last saturday, the PaleoLab took part in the VII Semana Nacional do Cérebro, explaining how to study the brain of dinosaurs and other extinct animals to the broad audience at Praça XV, downtown Ribeirão Preto. 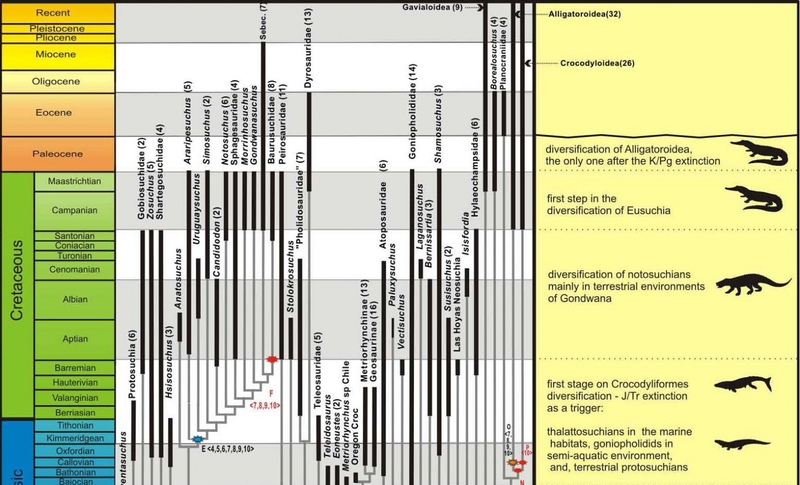 Published today, in Palaeontology (see here), paper by current (Gabriel Ferreira, Max Langer) and old (Pedro Godoy, Felipe Montefeltro, Bruno Vila Nova) members of the PaleoLab, with colleague from the University of Birmingham, discussing the effects of heterochrony in the evolution of Baurusuchidae, based on a juvenile of Pissarrachampsa sera. Published today, in Zootaxa (see here), paper co-authored by Max Langer, with UFSM colleagues, about the inner phylogenetic relations of the Lagerpetidae. This week, the PaleoLab receved the visit of Sterling Nesbitt (Virginia Tech University, EUA), working in a join project with Prof. Max and enjoying happy-hours with the team. Published today, in Zoological Journal of the Linnean Society (see here), paper by Sívio Onary and Annie Hsiou revising the taxonomy of Pseudoepicrates stanolseni, a Miocene Boidae from the US. 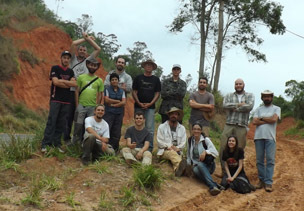 Between February 21st and 27th, a PaleoLab team, along with colleagues from UNESP and UNIVASF, conducted field work to the Juro-Cretacic rocks of the Tucano Basin, in Bahia. 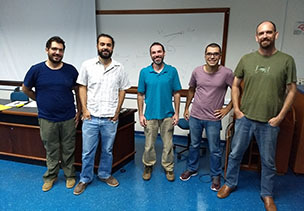 In the photo (left to right): Estevan, Marquinho, Felipe, Shummi, Sílvio and UNIVASF students. 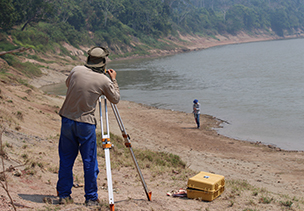 Published in Gondwana Research (see here) paper by Max Langer providing the first radioisotopic ages for the Triassic rocks of Rio Grande do Sul. Work with colleagues from UFSM and Massachusetts Institute of Technology. 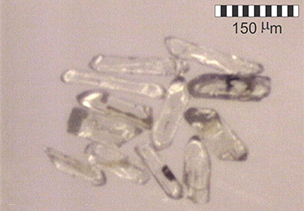 Photo with some of the dated zircon crystals. Published today, in Palaios (see here), paper by Marcos Bissaro, Fernando Adorni, Fellipe Muniz and Annie Hsiou, with colleagues from UNESP and UFAC, describing the use of a "Total Station" in paleontological research, with a case study in Miocene rocks in Acre. 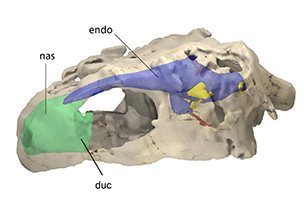 Published today, in Fronties in Ecology and Evolution (see here), paper co-authored by Gabriel Ferreira, with colleagues from Germany and the UK, describing the neuroanatomy of one of the oldest turtle, Progranocheys quenstedti, from the German Triassic. New paper with PaleoLab help. 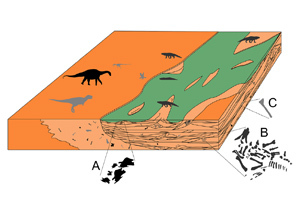 Published yesterday, in Journal of Iberian Geology (see aqui), paper co-authores by Giovanne Cidade, with colleagued from UFRJ, discussing the taphonomy of the dinosaur and crocodile records of the Bauru Group. New turtle from the Cretaceous of São Paulo. 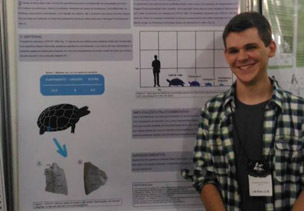 Published yesterday, in Paläontologische Zeitschrift (see here), paper by Gabriel Ferreira, Guilherme Hermanson and Max Langer, with collagues from Museu de Paleontologia de Monte Alto, describing new fossil turtles from the Crataceous, with the description of a new species: Yuraramirim montealtensis. 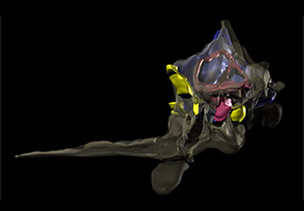 Computed tomography image of its skull is shown in the figure. 2018 begun with changes in the PaleoLab team. Mariela left for her position at UFG (but will carry on apearing here), whereas "Roque" returned form his PhD in Germany for a post-doc fundede by CNPq. 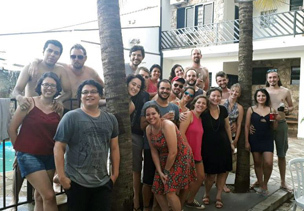 This is the third PaleoChristmas reported in this site, this time it took place at Julio's house, with more than 20 participants, 50 liters of beer, and much more. Let 2018 begin! Finished today, with a barbecue at Átila's place, field-work to the Triassic of Rio Grande do Sul, with colleagues from UFSM. 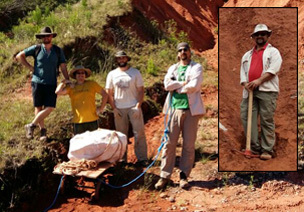 In the photo (left to right), Blair McPhee, Sílvio Onary, Júlio Marsola e Max Langer, with a dinosaur in the plaster jacket and Átila Da Rosa in the box. Published today, in PeerJ (see here), paper by Max Langer, Átila da Rosa e Felipe Montefeltro, presenting the geologic mapping of the area of Tunduru, south Tanzânia, where the PaleoLab conducted a field-trip in 015, and the redescription of a rhynchosaur collected there in the nineteen fifties. Pathology in a fossil croc. 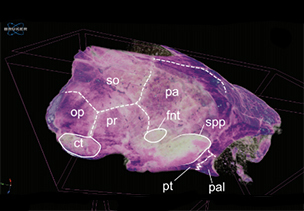 Published yesterday, in Historical Biology (see here), paper by Giovanne Cidade and Annie Hsiou, with colleagues from Venezuela, describing a pathology in the palate of Mourasuchus, Miocene of Venezuela. 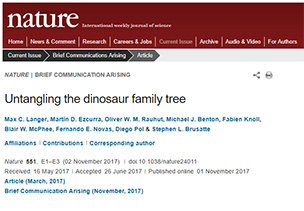 Published today, as a Brief Communications Arising in Nature (see here), paper by Max Langer, Blair McPhee and (many) colaborators - Martin Ezcurra, Oli Rauhut, Mike Benton, Diego Pol, Fernando Novas, Fabien Knoll, and Steve Brusatte - challenging the recent proposal of grouping theropods and ornithischians in Ornithiscelida. Yesterday, 01/11/2017, Thiago Fachini, aka Shummi, got his MSc at the Comparative Biology Graduation Program. In the photo (left to right): Mariela Castro, Annie Hsiou (supervisor), Fabiano Iori, and Max Langer. Congrats Shumeto! 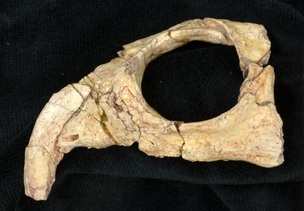 Published yesterday, in Zoological Journal of the Linnean Society (see here), paper by Blair McPhee, with colleague from South Africa, describing the osteology of the jurassic dinosaur Pulanesaura eocollum. Last week Annie passed her Livre Docência exam, becoming the younger Associate Professor at FFCLRP/USP. 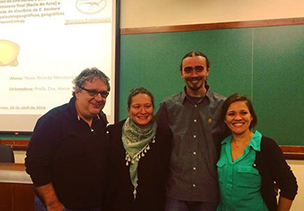 In the photo, the panel, from left to right: Cesar Schultz (UFRGS), Frésia Ricardi Branco (UNICAMP), Dalton Amorin (USP), Oranjel Aguilera (UFF) and Tiana Kohlsdorf (USP). Congrats Annie! 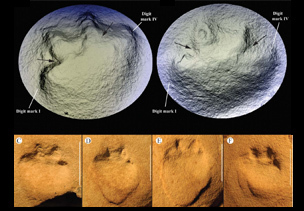 Published today, in Scientific Reports (see here), paper by old (Mario Bronzati, Jonathas Bittencourt) and current (Max Langer) members of the do PaleoLab, describing the endocast of the triassic dinosaur Saturnalia tupiniquim. 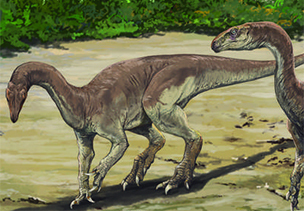 The study helps understanding the behaviour of the oldest dinosaurs. 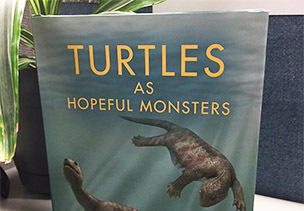 Gabriel Ferreira, aka Fumis, published today a review in Evolution & Development about the book "Turtles as Hopefull Monsters" by Olivier Rieppel. Published last week, in Acta Palaeontologica Polonica (see here), paper by Blair McPhee and South African colleagues, with a review of the stratigraphic distribution of sauropodomorphs along the Triassic-Jurassic bounday in the Karroo Basin in South Africa and Lesotho. Published yesterday, in Journal of Herpetology (see here), paper by Sílvio Onary, Thiago Fachini and Annie Hsiou, with a review on Brazilian fossil snakes, including "that" on the left! 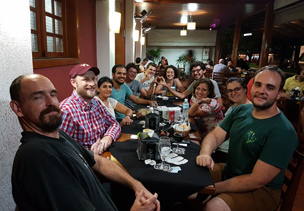 From July 21st to 26th, the PaleoLab organized, along with colleagues from UNESP and UFSCar, at Faculdade de Direiro de Ribeirão Preto-USP, the XXV Congresso Brasileiro de Paleontologia, with an attendance of nearly 500 people and the presentation of over 300 papers. 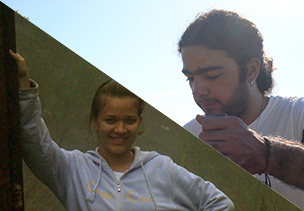 Last week, Mariela (Paleozoic PaleoLab member, in a 2008 picture on the left) was approved in a contest for lectureship in Vertebrate Zoology and Biogeography at Universidade Federal de Goiás (UFG) campus Catalão. Well done Mari! 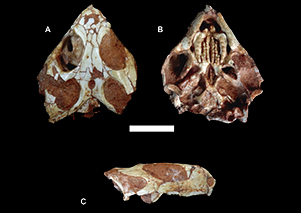 New rodent from the Miocene of Acre. Published today, in Historical Biology (see here), paper co-authored by Annie Hsiou and Marcos Bissaro, with colleagues from UFAC and UFSM, describing Ferigolomys pacarana, a new caviomorph from the Solimões Formation (Mioceno), in Acre. The generic epithet honours Jorje Ferigolo, Annie's ex-supervisor. Published today, in Papers i​n Palaeontology (see here), paper co-authored by Max Langer, with collagues from UFRGS, UFSM, and UNIVASF, describing a new cynodont from the Santa Maria Formation (Triassic). 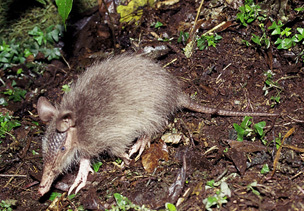 The image depicts a similar animal, Bonacynodon schultzi. From April 21st to May 7th, the PaleoLab, along with colleagues from MACN, CRILaR, and UFRGS, conducted field-work in the Triassic deposits of the Ischigualasto Formation, in La Rioja, Argentina. Rhynchosaur, cynodont, and archosaur fossils were collected. 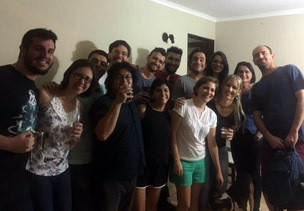 In the photo (left to right): Blair, Julian, Martin Hechenleitner, Max, Felipe Montefeltro, Agustin Martinelli - above; Martin Ezcurra, Julia Desojo, Jimena Trotteyn, Belén von Baczko e Voltaire Paes Neto - below). 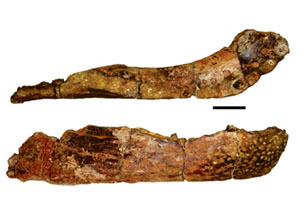 Published this week, in Ichnos​ (see here), paper by Simone D'Orazi-Porchetti and Max Langer, with the colleague from UNESP campus Rio Claro, Reinaldo Bertini, describing a new mammal ichnospecies from the Botucatu Formation (Juro-Cretaceous). 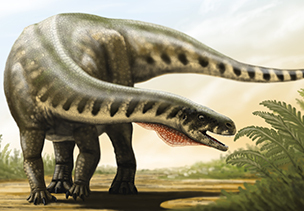 Published today, in Cretaceous Research​ (see here), paper by Julian Silva Júnior, with colleagues from UFTM, describing a juvenile titanosaur from the Cretaceous of the Uberaba-MG area. 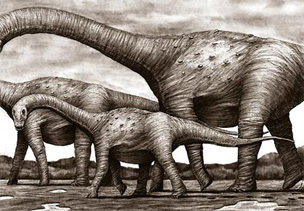 The image by Marcos Paulo depicts a titanosaur group. Published today, in Tropical Conservation Science​ (see here), paper by Mariela Castro, with colleagues from Oklahoma State University, discussing the ecological biogeography of Dasypus pilosus, this strange thing on the left. Published today, in PeerJ (see here), paper by Giovanne Cidade and Annie Hsiou, with colleagues from IVIC and UFU, describing a new croc species, Mourasuchus pattersoni, from the Miocene Urumaco Formation, Venezuela. Afther one month of refurnishing, the new face of the PaleoLab. Obviously they are only pretending to work. 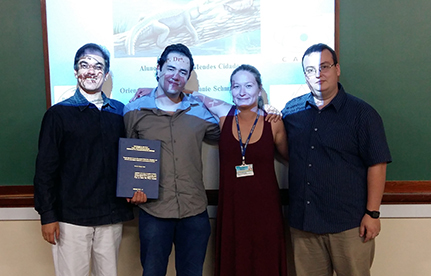 Yesterday, February 3rd 2017, Fábio Carbonaro got his PhD about Devonian trilobites at the Comparative Biology Graduation Program. 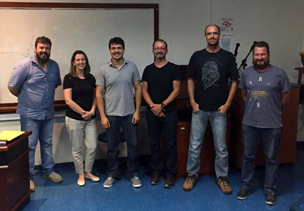 In the photo (left to right): Renato (de facto supervisor), Juliana Leme, Fábio, Luiz Eduardo Anelli, Max (formal supervisor) and Sandro Sheffler. In the same volume of Revista Brasileira de Paleontologia in which the 100th PaleoLab paper was published, the 101st also apeared (see here). Besides, last week, the PaleoLab received its new Post-Doc, Blair McPhee (on the left). 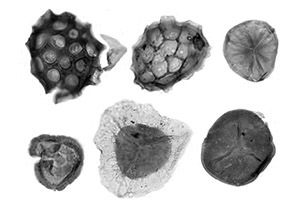 It is quite funny that the 100th PaloLab paper is about Devonian palynology. Fourth of a series of papers derived from the PhD of Fábio Carbonaro. Friday, December 16th 2016, we had our PaleoChristmas at Mariela's place. Paleo-kids barbecue, Lund beer, and many more! 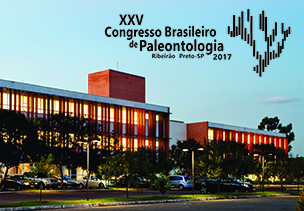 XXV Congresso Brasileiro de Paleontologia. 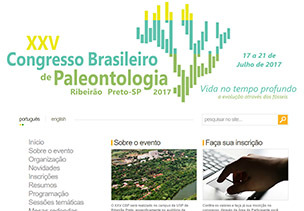 Already on the XXV Congresso Brasileiro de Paleontologia web-page (see here), to take plave at the Ribeirãp Preto USP campus, from the 17th to the 21st of July 2017. See you in Ribeirão! Broadcasted today (see here), program shot during 2012 about underwater cave fossil digging in Chapada Diamantina, Bahia. 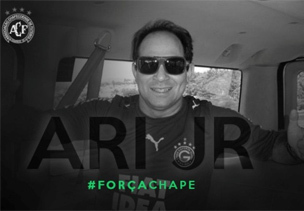 In honour of the camera-man Ari Jr. (in the photo) dead in the Chapecoense flight. 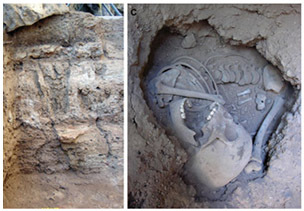 Published yesterday, in Antiquity (see here) paper co-authored by Marcos Bissaro describing ancient amerindian rithuals from the Holocene deposits of Lapa do Santo cave, in Minas Gerais. 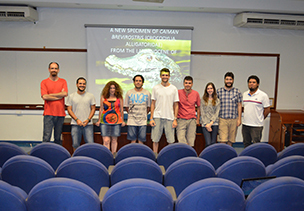 Friday, November 18th, Sívio got his MSc on fossils snakes from the Comparative Biology Graduation Program. The paned was composed by Liza Pacheco, Marco de França, and Max Langer. Well done Sílvio! Yesterday, current (Max Langer, Júlio Marsola) and ex- (Jonathas Bittencourt, Mario Bronzati) members of the PaleoLab, published in Current Biology article describing two new species of Dinosauromorpha from the Triassic of south Brazil. Collaboration with colleagues at ULBRA, UFSM, Museu Nacional, among others. 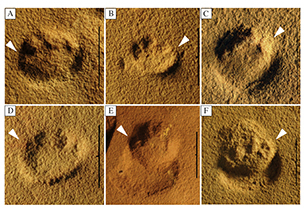 Today, Simone D' Orazi Porchetti and Max Langer published in Palaeogeography, Palaeoclimatology, Palaeoecology article describing the gait variability and locomotor skills of the mammal Brasilichnium elusivum, based on footprints from the Botucatu Formation from Araraquara. Collaboration with colleagues from UNESP campus Rio Claro. 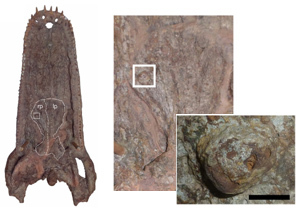 Today, Guilherme Hermanson, Gabriel Ferreira and Max Langer published in Historical Biology article describing a turtle peripheral plate from the Bauru Basin, Uberaba area, that represents the largest Cretaceous Podocnemidoidea. 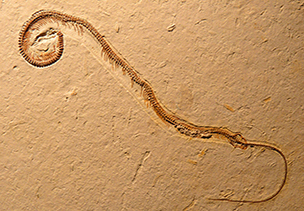 This was the first article published by an undergrad student from the PaleoLab. Well done Squirtle (! ), who in the next photo presents a poster about his paper at the X SBPV, Rio de Janeiro. 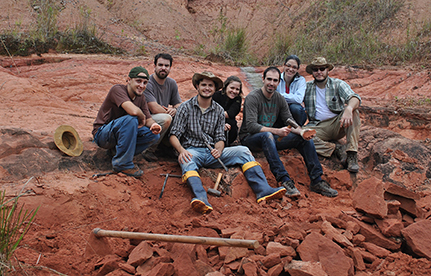 Between October 10th and 14th, 2016, the PaleoLab team, along with UFRGS and Museu Aristides Carlos Rodrigues, conducted fieldwork on Triassic rocks in the area of Candelária-RS. 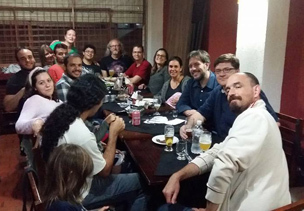 In the photo (from left to right): Luan, Schultz, Tomaz, Wafa, Morgan, Carlos, Fuchs, Agustin, Marcel and Marco (standing), Voltaire, Squirtle, Max, Bete and Ana (seated). X Brazilian Symposium on Vertebrate Paleontology. Between October 3rd and 7th, 2016, members and ex-members of the PaleoLab, attended the X SBPV, at Museu Nacional, Rio de Janeiro. 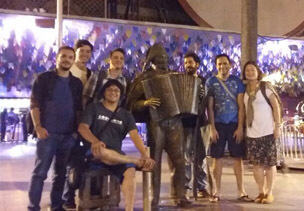 In the photo (at São Cristóvão fair and from the left to the right): Gabriel, Felipe Muniz, Sílvio, Bruno, accordion player, Felipe Montefeltro, Giovanne and Annie. 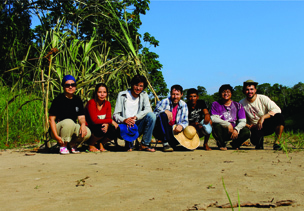 Between August and September 2016, the PaleoLab team, including Marcos, Sílvio, Felipe (first, second and fifth in the phooto, from right to left), among others, developed extensive fieldwork in the Juruá and Purus rivers, in Acre. Work with partners from UFAC and FZB/RS. 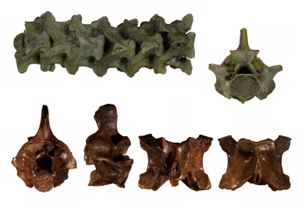 In the same issue of Revista Brasileira de Paleontologia, Giovanne Mendes Cidade published another article describing new crocodylian fossils from the Miocene of Acre. Collaboration with colleagues from UFRJ, UFU e CPRM. In the next figure, Gavialoidea lower jaw parts, including Gryposuchus. Lizards from the "Bear Cave". 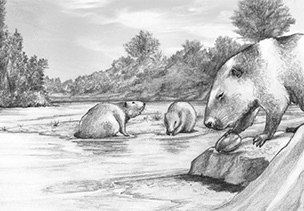 This week, Annie Hsiou and Silvio Onary-Alves published, in Revista Brasileira de Paleontologia, article describing new lizzard fossils from the quaternary "Gruta do Urso" (= "Bear Cave") in Tocantins, central Brazil. Collaboration with colleagues from UNIRIO and East Tennessee State University. In the next figure, a teid lower jaw in lateral and medial views. 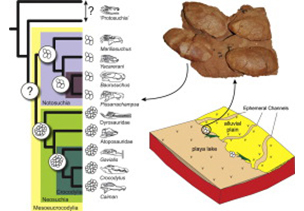 Today, Sílvio Onary-Alves and Annie Hsiou published in Alcheringa, article describing fossil boas (Boa constrictor) from the famous tar pit El Breal del Orocual, Plio-Pleistocene of Venezuela. Another collaboration with Ascanio Rincón, Instituto Venezoelando de Investigaciones Científicas (IVIC). Yesterday, June 1st 2016, Jeanninny got her PhD viva. 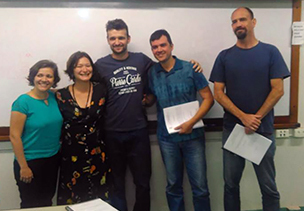 In the picture (from left to right): Max, Jeanninny, Renato Ghilardi, Élvio Bosetti, Juliana Leme and Liza Pacheco. As not to forget taphonomists and paleocheloniologists, Marcos (on the left, thoughtful) and Gabriel (on the right, laugthing as aways) are leaving in the end of the year for the overseas part of their PhDs, respectively at University of Arkansas, USA, and Universität Tübingen, Germany. Yes, it is nearly done the building of the new PaleoLab preparation area for fossil and living (disgusting!) organisms. With special thanks to the join student venture of preparing the ground to receive the containers. 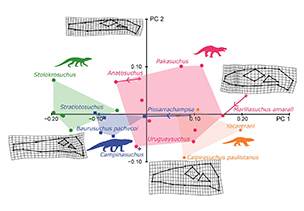 Today, Palaeogeography, Palaeoclimatology, Palaeoecology published a new paper authored by Júlio Marsola, describing a Late Cretaceous crocodyliform nesting site. Collaboration with colleagues Alessandro Batezelli (Unicamp), Felipe Montefeltro (Unesp) and Gerald Grellet-Tinner (CRILaR). Last week, Estevan moved to his new permanent job at UNIVASF. In a couple of weeks, Júlio will leave for the overseas part of his PhD, in Birmingham. Different moments, equivalent feelings. The PaleoLab will miss you guys and wishes the best luck for both. Yesterday, PeerJ published a new paper authored by old (Marco Aurélio de França) and current (Júlio Marsola, Annie Hsiou, Max Langer) PaleoLab members, describing new jaw elements of the cretaceous titanosaurid sauropod Maxakalisaurus topai, found in the area of Prata, Minas Gerais, Brazil. This week the PaleoLab was visited by the palaeontologists Mike Caldwell (University of Alberta, Canada) and Randall Nydam (Midwestern University, USA), who worked on a join project with Annie Hsiou. In the photo, one of the many happy-hours of these days, with the visitors on the back. 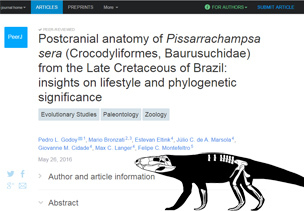 Yesterday, PeerJ published a new paper authored by old (Pedro Godoy, Mário Bronzati, Estevan Eltink, Felipe Montefeltro) and current (Júlio Marsola, Giovanne Cidade, Max Langer) PaleoLab members, describing the postcranial anatomy of the crocodyliform Pissarrachampsa sera, a taxon that (according to most authors of the paper) should compose the new logo of the Lab. Ornitosuchians complain! 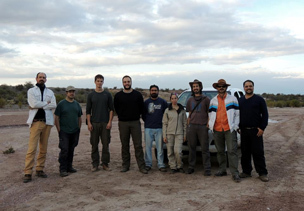 Between May 2nd-13th, the PaleoLab team, along with colleagues from MACN, CRILaR and UFSM, conducted a field-trip to the triassik deposits of the Ischigualasto Formation, at the Hoyada del Cerro Las Lajas site, in La Rioja, Argentina. Rhynchosaur, cinodont, and archosaur fossils were collected. In the picture (from left to right): Max, Martin Ezcurra, Rodrigo Müller, Júlio, Marco, Belén von Baczko, Jeremias Toborda, Lucas Fiorelli, and Átila da Rosa. Yesterday, April 28th, Paulo got his MSc viva. 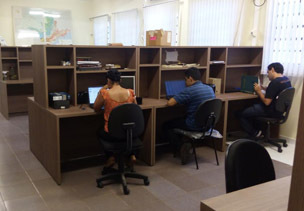 In the picture (from left to right): Mário de Vivo, Annie (supervisor), Paulo and Mariela. 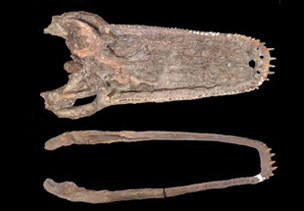 This week Journal of Systematic Palaeontology published the description and naming of a new temnospondyl species, Konzhukovia sangabrielensis (see here), from the Rio do Rasto Formation, Permian of Rio Grande do Sul. 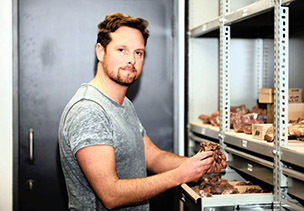 Estevan Eltink figures as a co-author of the paper, which is a collaboration with CAPPA/UFSM palaeontologists. 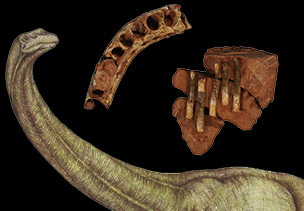 This weekend Paläontologische Zeitschrift published the formal naming of the "Mariante Rhynchosaur" (see here). 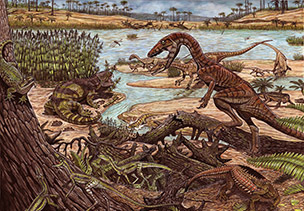 More than 25 years after its discovery, three generations of "rhynchosaurologists" were needed to deliver the description of one of the more emblematic fossils of the Triassic of Rio Grande do Sul. Authors include César Schultz (supervisor of Max's MSc thesis at UFRGS), Max himself, and his ex-student Felipe Montefeltro (now at UNESP). Want to know what anagenesis is? 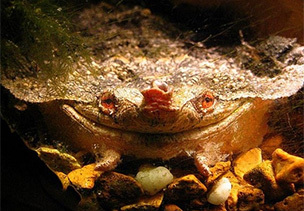 Ask the matamata! 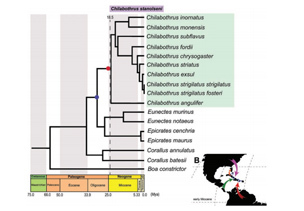 Yesterday, The Science of Nature (ex-Naturwissenschaften), published a paper by Gabriel Ferreira, Max Langer and co-workers, describing new material of Chelus (genus of the extant matamata turtle) from the Miocene of Venezuela. It is suggested that anagenesis played an important role in the evolution of these animals for the last 20 million years. 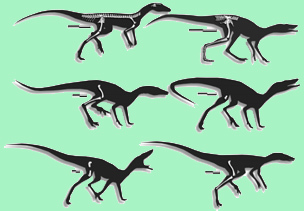 Yesterday, Historical Biology published a paper by Rodrigo Müller, Universidade Federal de Santa Maria MSc student, co-supervised by Max Langer, describing a new "prosauropod" partial skeleton, from the area of Agudo, Rio Grande do Sul. Good news for the PaleoLab staff. 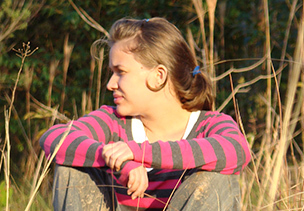 The Brazilian agency CNPq awarded Annie Hsiou with a "productivity" grant, wereas Max Langer became a "1D" researcher. 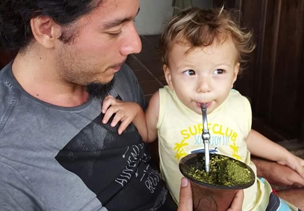 Gael, Annie's son (with his father on the left), thanks that he can now swich from boiling mate to warm milk. 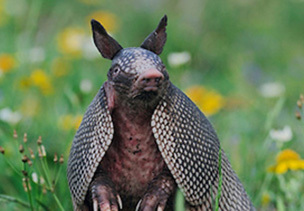 This week, Revista del Museo de La Plata published a paper by our post-doc Mariela Castro with a broad-scale taxonomic review of the armadillos tribe Dasypodini (Xenarthra, Cingulata, Dasypodidae), including both fossil and extant forms. 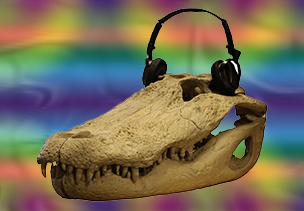 This week, Journal of Anatomy published a paper by Felipe Montefeltro (ex Paleolab member) that discusses earing in fossil crocodiliforms, with the interesting suggestion that the Baurusuchidae (carnivorous crocs from the Cretaceous of South America) possessed analogue structures to the mammalian ear. 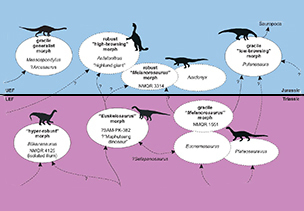 Yesterday, Frontiers in Ecology and Evolution published a paper by Martin Ezcurra, Felipe Montefeltro (ex PaleoLab member) and Richard Butler in which a rhynchosaur from the Middle Triassic of England is named after Max Langer. The holotype of Langeronyx brodiei, a partial skull housed at the Warwickshire Museum, Warwick-UK, is shown on the left. Saturday, December 12th, the PaleoLab team celebrated "Paleo Christmas" at Marcos Bissaro (LaleoLab PhD candidate) place. We barbecued, had some (a lot of) beer and Annie's potato salad, and played volleyball; with the extra presence of the ex-PaleoLab member Carol (Xirra) Laurini. 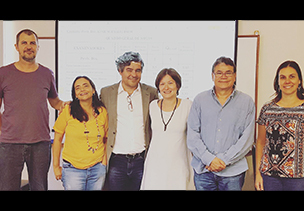 Between October 19th and 23rd, 2015, Professor Julia Brenda Dejoso (Museo Argentino de Ciencias Naturales and Universidad de La Plata) has been delivering a course on Triassic Arcossauriformes within the Comparative Biology Graduation Program, FFCLRP-USP. 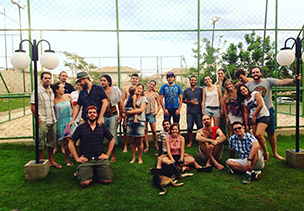 In the photo (left to right): Max, Gabriel, Julia, Giovanni, Thiago, Marcos, Ana Carolina, Gabriel e Andrés. 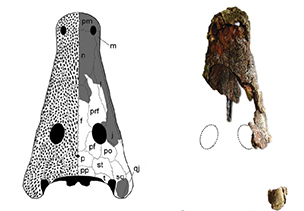 Out today on-line first version at Zoological Journal of the Linnean Society new article about the temnospondyl Australerpeton cosgriffi, Permian of Paraná (Brazil), with details on their cranial anatomy and phylogenetic position (see here). 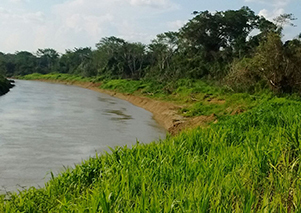 During September, the PaleoLab team, leaded by Marcos Bissaro, has been digging Miocene deposits of Acre and Purus rivers (Amazon Basin). Mammal, crocs and turtle fossils were collected. Photograph of the Niteroi site, Rio Acre. 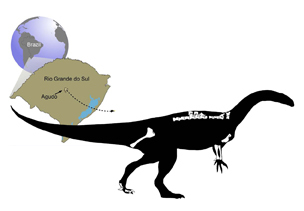 Today, in PLOS ONE (find aqui), new paper on the sphenodonts, Clevosaurus, from the Triassic of Rio Grande do Sul, with details on their cranial anatomy and phylogenetic position. 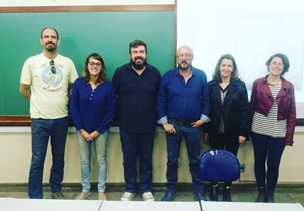 During this year SBP meeting, in Crato/CE, it was defined that the XXV Congresso Brasileiro de Paleontologia will be organized by the PaleoLab in Ribeirão Preto. 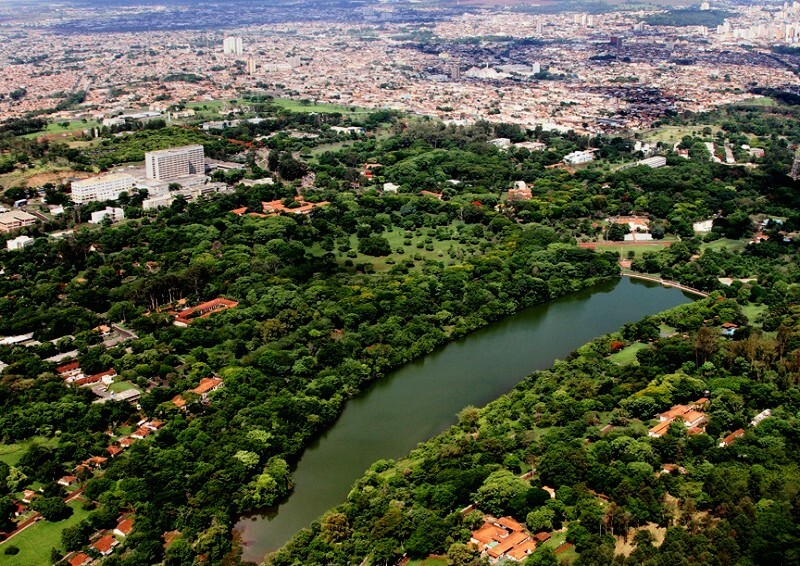 Photo of the Universidade de São Paulo campus in Ribeirão. 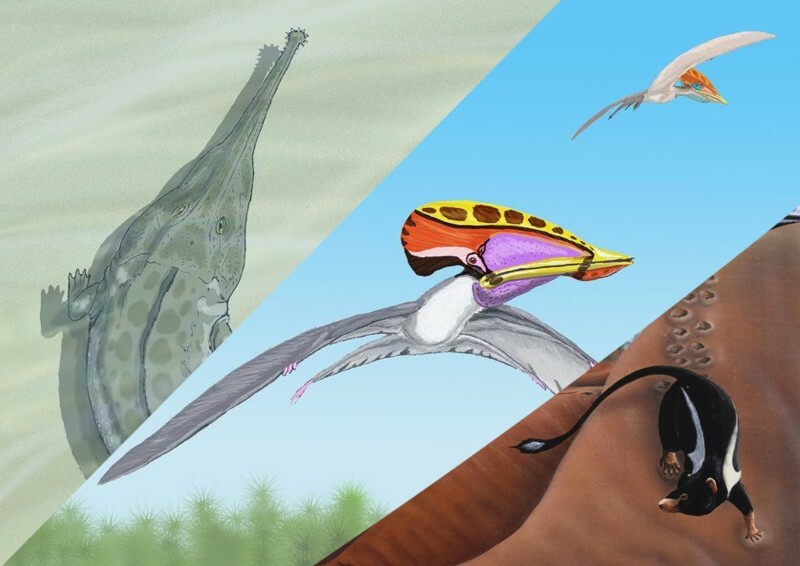 Several PaleoLab papers have been published or accepted for publication at the middle of this year (details here). This includes work on temnospondyles, pterosaurs, and mammal tracks. 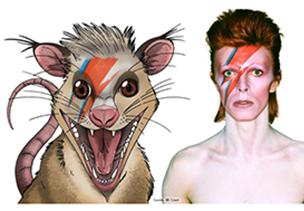 Figures from different sources. 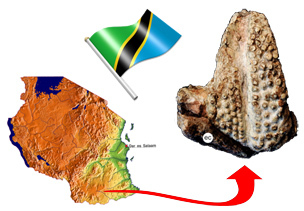 Along July this year, the ;PaleoLab team, with the help of Prof. Átila da Rosa (UFSM) has been mapping Triassic rocks in south Tanzania. Unfortunately, despite nearly 50 visited outcrops, no vertebrate fossil has been collected. 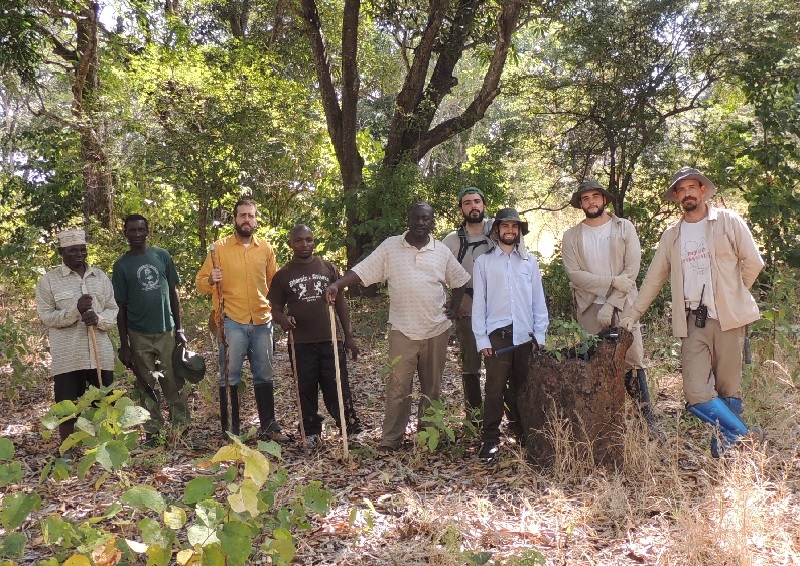 Photo of the team at the old Msamara village. 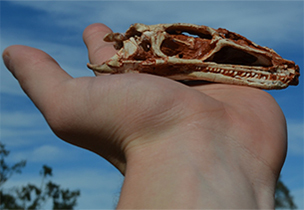 On June 30th Gabriel, PhD student at the PaleoLab, published his second article. It is a description of a new turtle from the Miocene of Venezuela, and a review of the paleoecology of , the Stereogenyina, published on the online journal PeerJ. 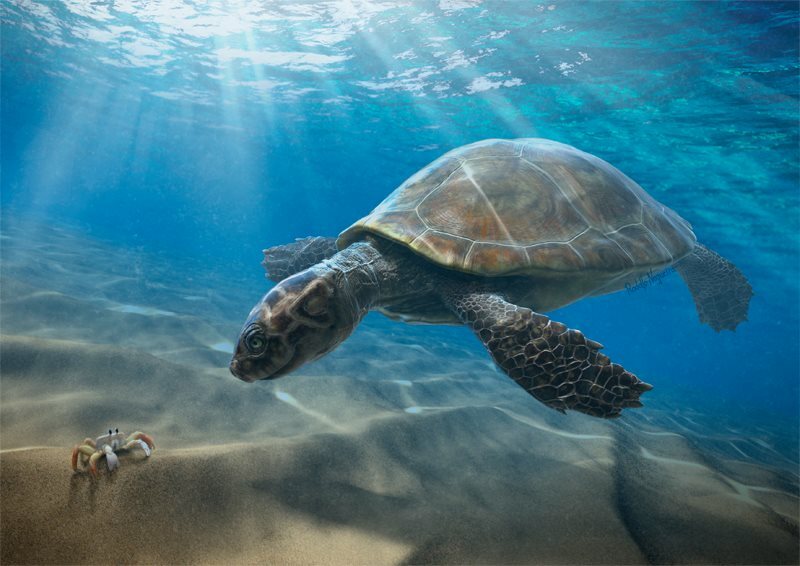 The figure shows a reconstruction of the new turtle, by Rodolfo Nogueira. Yesterday, June 9th, Giovanni got his viva. In the photo (left to right): Douglas Riff (with the PaleoLab logo stamped on his face), Giovanni (without his cap!!! ), Annie (lookong like her mother) and Daniel Fortier (with no peculiar feature). First images of the join campaign with Universidade Federal do Rio Grande do Sul. Linha São Luiz site, Faxinal do Soturno. May 2015. New MS accepted for publication. Finally!!!! We have almost given up! Las week Mario (since last year in Germany) got his MS on diversification of Crocodyliformes accepted for publication in Royal Society Open Science. A bit late because of the renewing of the site. 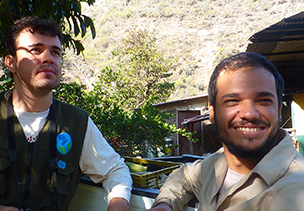 During February, the PaleoLab team has been on the field in Venezuela. A lot of work, some fossils, and a responsible amount of beer. 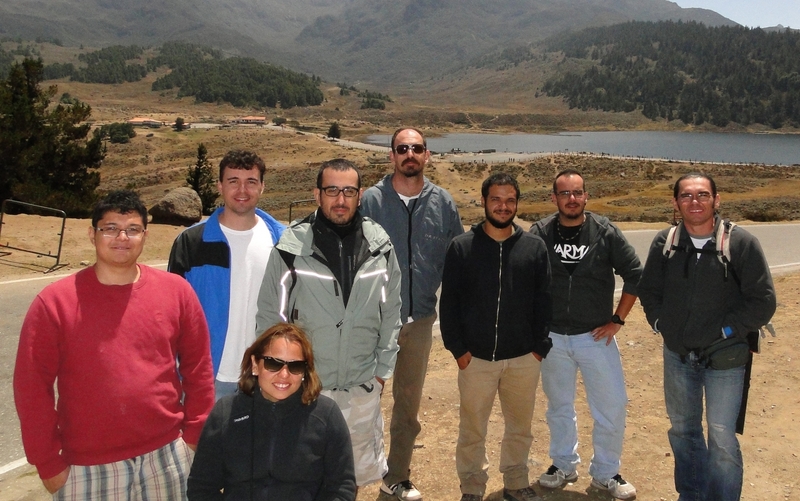 Photograph in Sierra Nevada National Park (from left to right: Sílvio, Marcos, Monica, Simone, Max, Gabriel, Damian, and Ascanio).